KOF King Of Fighters fan remake. 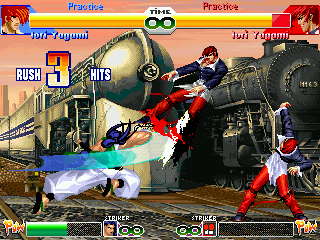 Great Fighting game. Uses bennu engine (ported by stuckie to pandora). Please leave comments if this game works for you, or if you like it. Several people have posted comments that they cant get past the menu screen, looking for confirmation. Works here ;) But quite slow, maybe 70% of the original speed.